Plot: Lara Croft, the fiercely independent daughter of a missing adventurer, must push herself beyond her limits when she discovers the island where her father disappeared. Starring: Alicia Vikander, Dominic West, Walton Goggins, Daniel Wu. 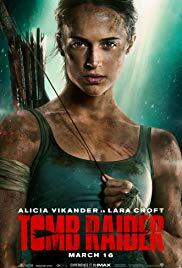 distributed by Warner Bros. «Tomb Raider» in the US movie theaters released on March 16, 2018 and has grossed over $274 million worldwide; dvd and blu-ray release date was set for June 12, 2018. Rent from Netflix and Redbox from June 19, 2018. «Tomb Raider» in the UK released in movie theaters on March 16, 2018. The movie released on dvd and blu-ray on July 16, 2018.